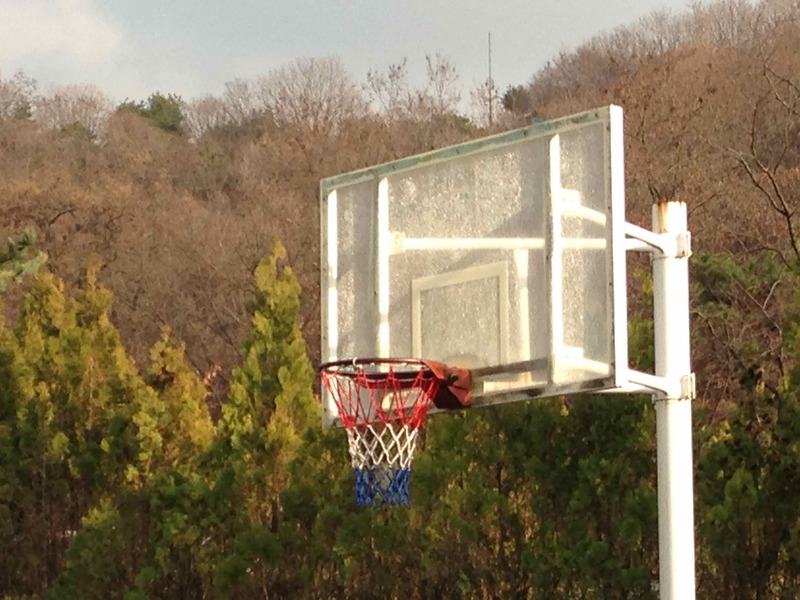 Jeongalsan Park's basketball court sits behind the Goyang Aram Nuri Arts Center and at the foot of Jeongbal Mountain. 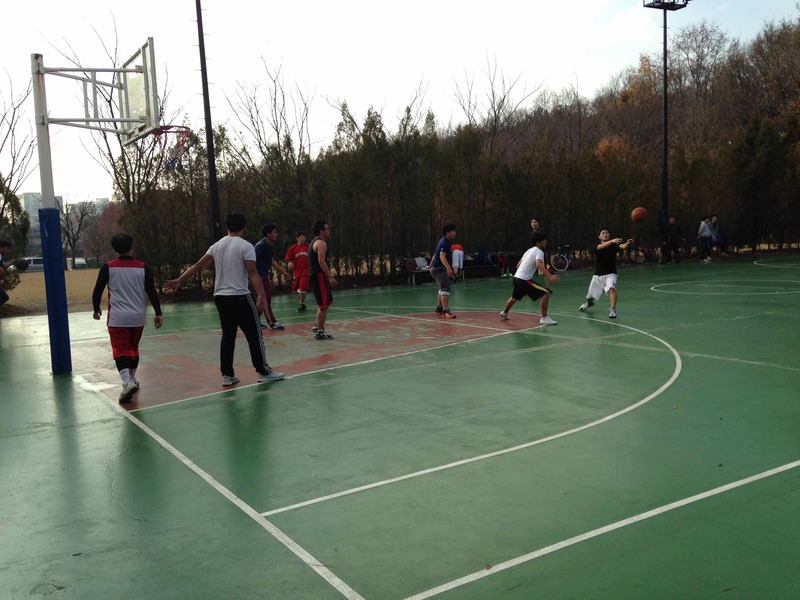 It is a splendid basketball court hidden away from the chaos of the city. 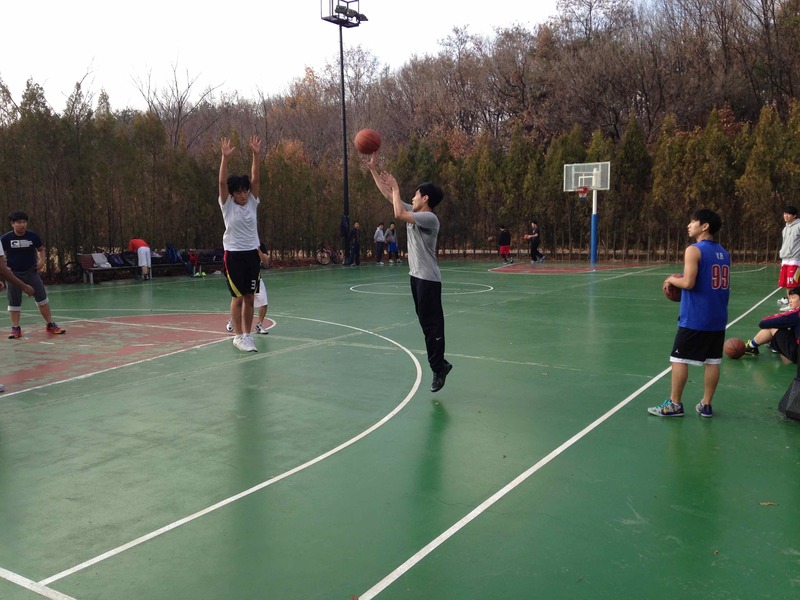 Although the basketball court is off the well-trodden path, it is a popular place for pick-up games. 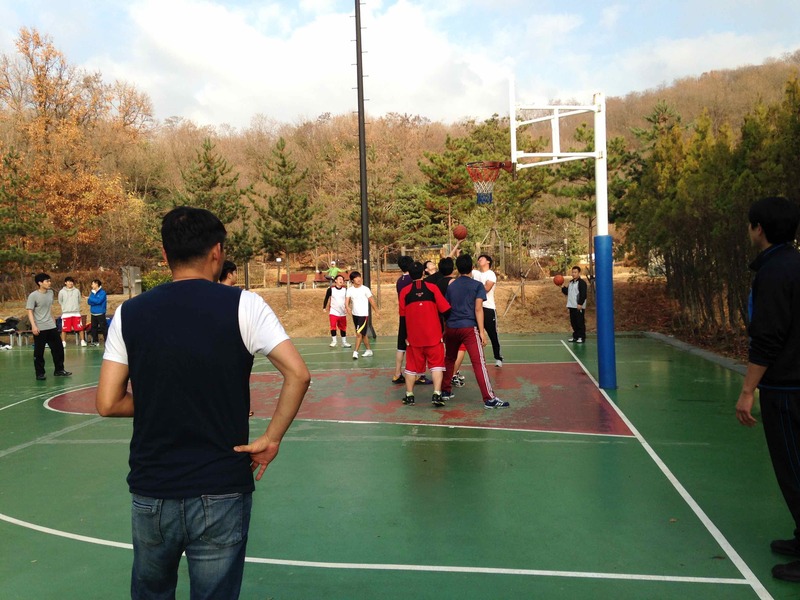 It is perhaps the best court in Ilsan to find regular pick-up games. There's always gotta be a coach. 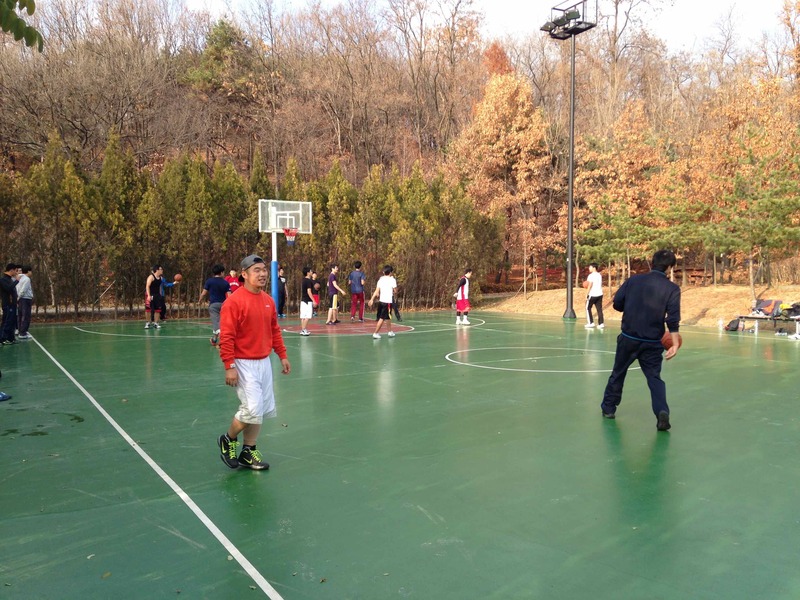 Jeongbalsan Park's basketball court, though a bit hidden, is not far from busy Jeongbalsan Station on line 3 in Ilsan. As such, it gets plenty of action. Especially on the weekends. It is a great place to find a game of pick-up ball. Just make sure you keep winning once you get on the court. If you lose, you may have to wait a while to get back on the court. Scenic location. A thick row of trees border the court on 3 sides. On the other side is a lovely park at the base of Jeongbal Mountain. Lots of pick-up games (weekdays). There is a steady flow of traffic, so it is easy to find pick-up games. As far as municipal park basketball courts go, this one has decent lighting. Night games are no problem here. Pick-up games (weekends). There is a heavy flow of traffic, so it can be difficult to get court time because there are so many players. Bathrooms and water fountains are available near the court. That should make those needing a drink or a place to relieve themselves happy. 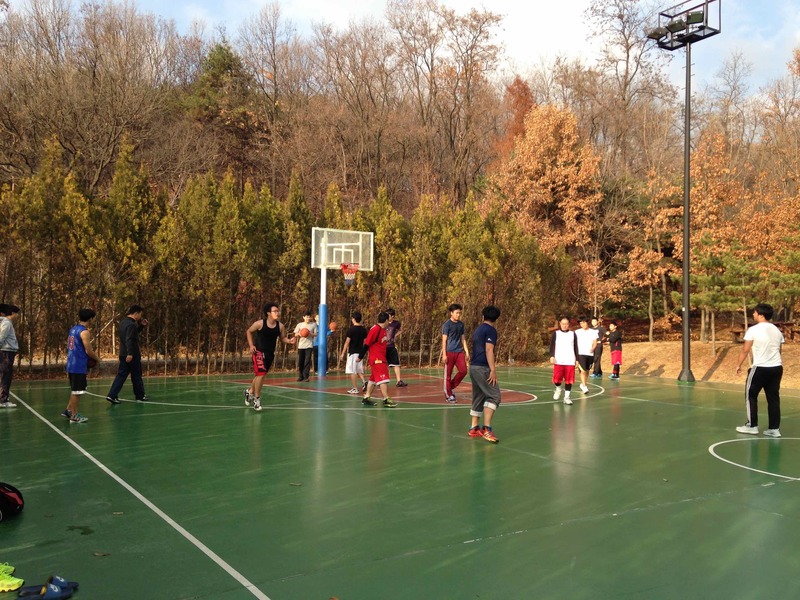 To see more photos, check out the Jeongbalsan Park Basketball photo album. -Go out exit 3. Walk straight and you will fin yourself in front of the Goyang Aram Nuri Arts Center. Find your way to the rear of this complex. There is a park behind the buildings, and the basketball court is in this park.